Israel is livid after France’s foreign minister reportedly met with leaders of Hizbullah’s “political wing” in politically-paralyzed Lebanon. 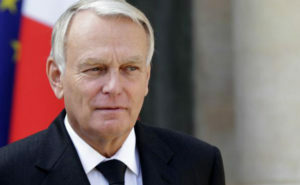 Jean-Marc Ayrault met with a political delegation of Hizbullah in Lebanon on July 12, according to local media reports. “It’s clear that Foreign Minister Ayrault would not meet with the ‘political wing’ of Islamic State (ISIL),” Israel’s Foreign Ministry said in a statement. The Arab League in May of this year declared Iran-backed Hizbullah a terrorist organization, with all but two of the 22-member bloc voting for the resolution. The Lebanese news site al-Joumhouria quoted “well-informed” sources who said the delegation that met with Ayrault included lawmaker Ali Fayyad, from Hizbullah’s political party Loyalty to the Resistance Bloc, as well as the head of the terror organization’s international relations, Ammar al-Musawi. Ayrault was in Lebanon for a two-day trip for what was said to be an effort to help the country move past the political paralysis that has prevented the election of a new president. Lebanon has been without a president since Michel Sleiman stepped down in May 2014 because of deep divisions between the country’s politicians. Both the cabinet and the parliament have been paralyzed in the wake of Sleiman’s resignation.